Home Tags Posts tagged with "prince george first day of school"
Kate Middleton missed Prince George’s first day at school as she was not well enough to take him. Prince William dropped the 4-year-old son off as Kensington Palace said Kate Middleton, who is suffering from severe morning sickness, was still unwell. Prince George is attending Thomas’s Battersea, a $23,500-a-year preparatory school in London. His uniform includes navy shorts and jacket, long red socks and black shoes. The milestone for Prince George comes after Kate Middleton and Prince William this week announced they are expecting their third child. Kate Middleton had to pull out of public engagements on September 4 and 5 because she is suffering from hypremesis gravidarum, as with her previous two pregnancies. Prince William drove the little prince through the school gates before helping him out of the car. The father carried the son’s bag and held his hand as the pair walked up to the entrance. They were then greeted by Helen Haslem, head of lower school, and Prince George shook her hand before being accompanied to his first class. Prince William told Helen Haslem that Prince George had been eagerly watching and he had “noticed” the other boys going into the school in their uniforms. The royal has joined a class of 20 other pupils and has his own desk and peg with his name on. He will begin by doing half days as a “gentle” introduction to school life. 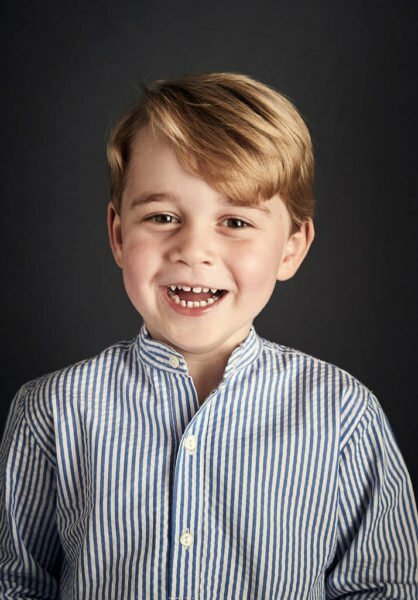 Ben Thomas, principal of Thomas’s London Day Schools, said there would be no special treatment for Prince George. “We are going to try and make this a really happy, safe and secure time,” the principal said. The uniform for Thomas’s Battersea is only available at the Peter Jones department store in Sloane Square or from the second-hand uniform shop at the school. For boys in reception class, the outfit consists of a navy jacket, a v-neck jersey and navy Bermuda shorts. In winter, this is accompanied by a red polo neck and long red and navy socks. In summer, short-sleeved light blue shirts are required – which Prince George was sporting on his first day – along with navy ankle socks. Notable alumni at Thomas’s Battersea include Florence Welch – from Florence and the Machine – model and actress Cara Delevingne and Fresh Meat star Charlotte Ritchie. One cameraman and one photographer were at the school to capture Prince George’s first day, as Princes William and Harry went to Wetherby School in Kensington, before both going on to Eton College, in Berkshire. Their father, Prince Charles, was initially educated at home by a governess, but later attended the Cheam Preparatory School, in Berkshire. Prince William has previously pleaded for the press to respect his son’s privacy.